The base is drawn out below. Sizes are approximate and can be adjusted, but this is the size of the actual one in the picture. 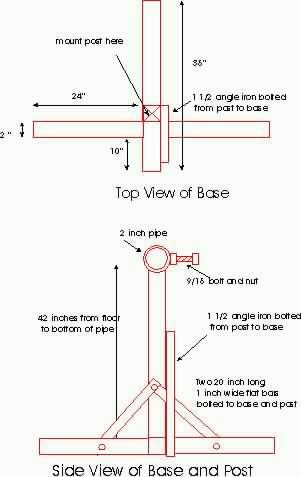 Use 2" Square Tubing for the Base and Post, 1" or 1 1/2 " flat bar for the side supports, and 1 1/4" or 1 1/2" angle iron for the third support arm. The pipe on the top is a 2" inside diameter pipe with a 9/16 nut welded over a hole drilled in the pipe. 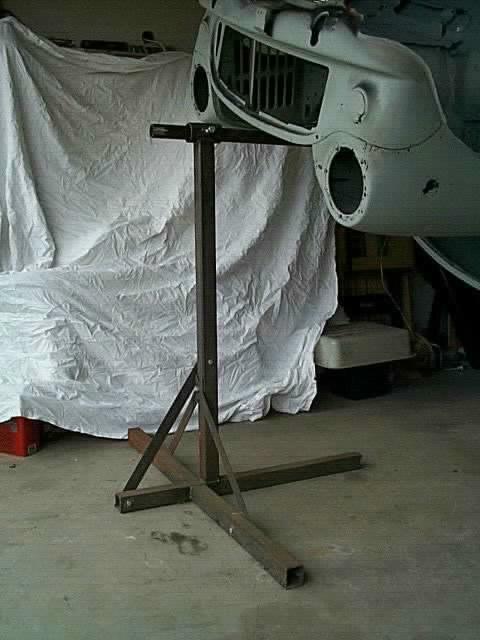 The bolt is then used to lock the car in postion as it pivots. A 12 foot 1 3/4 " outside diameter pipe will be run through the middle of the car and sits inside the pipe on the post. Here is a good shot of the completed base and post. You can see the braces and also the pipe and nut welded to the top of the post. Check out the next page for a closeup of the pipe and nut.